Suffixes are word endings that add a certain meaning to the word. 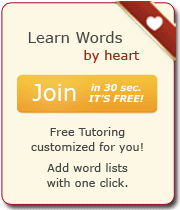 Click on the icon to the left and add the suffix list to your LearnThatWord profile for personalized review. If you don't have an account yet, you can start one in a few seconds. It's free!